After all that late-night birthday carousing (last night’s concert ended after 10 p.m. – long past my bedtime! ), I arrived late at the Seattle Urban Sketchers gathering at the University of Washington’s Botany Greenhouse. 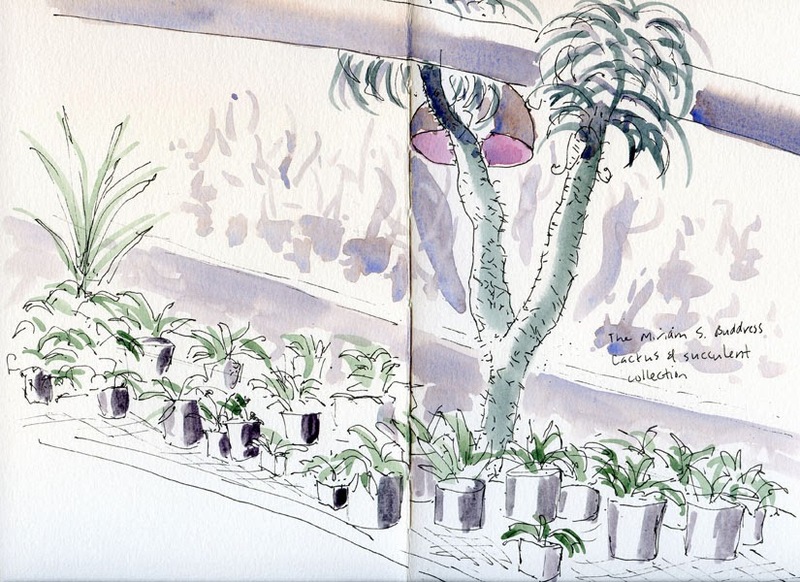 Fortunately, I’d sketched there in September with the Friday sketchers, so I didn’t feel like I’d missed as much. Last time I focused on “portraits” of individual plants. Today, with about 15 seconds to select a subject and less than 30 minutes to sketch, I chose a larger view of the Miriam S. Buddress Cactus and Succulent Collection, where I had marveled at all the otherworldly looking species. In my rush, I forgot to note the name of this tall, palm-like succulent that looks like it needs to shave its legs.